In a large stock pot, melt the butter over medium heat. Then add the bacon and render until crisp. Remove the bacon with a slotted spoon and drain on paper towels. Set aside. To the stockpot, add all the onions, shallots, salt, pepper, bay leaf, and thyme and cook, stirring until soft and caramelized. Then add the wine, leeks and garlic, cooking until soft. Dust the flour over and stir until blended well. Add the stock and Worcestershire sauce and bring to a boil. Reduce the heat and simmer uncovered for 45-60 minutes, stirring occasionally. Add the cream, stir to incorporate. Cook for 15 minutes. Remove the bay leaf and pulse the soup with an immersion blender. Serve the soup, garnishing with the bacon and chives. This soup is awesome! When we go and visit grammie and poppi, he always has fresh batchs of soup ready during the cold winter months! It’s a treat after a long snowy drive and even my three kids love it!!! We love it! Great recipe! 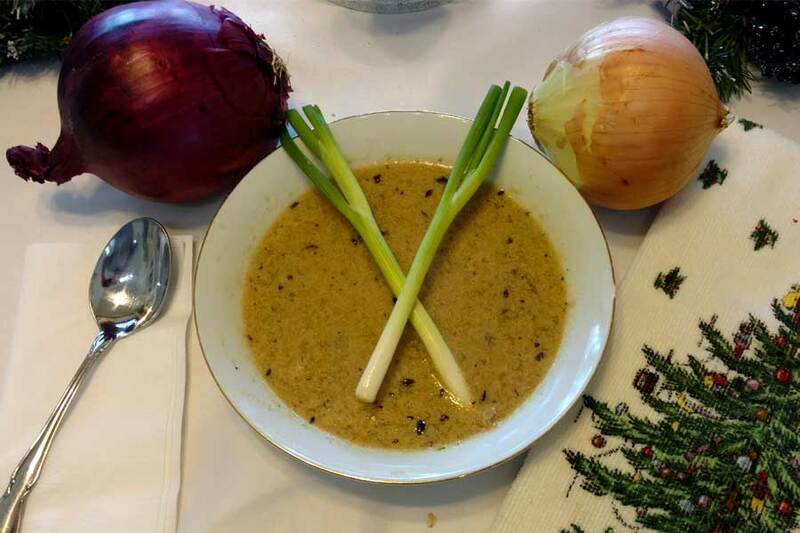 I love onions, I love the soup ! !